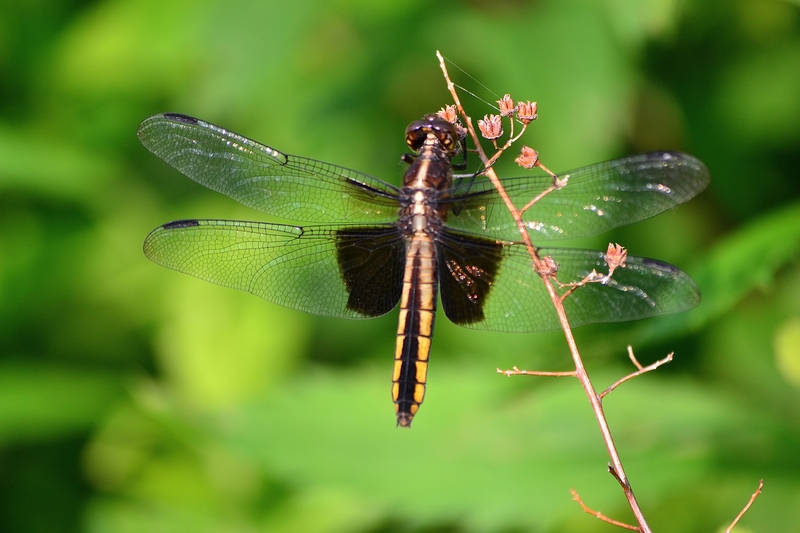 Dragonflies are common at our place as we have two ponds and a stream. It is always a pleasure to stand on the road and lean over the guardrail to peer into the water of the stream and watch the bright green bodied damsel flies, or to walk along the edge of the lawn where the tall grasses grow and observe the various dragonflies fluttering. And it is always a feeling of accomplishment if I can get close enough to one with my camera and snap a clear photo. 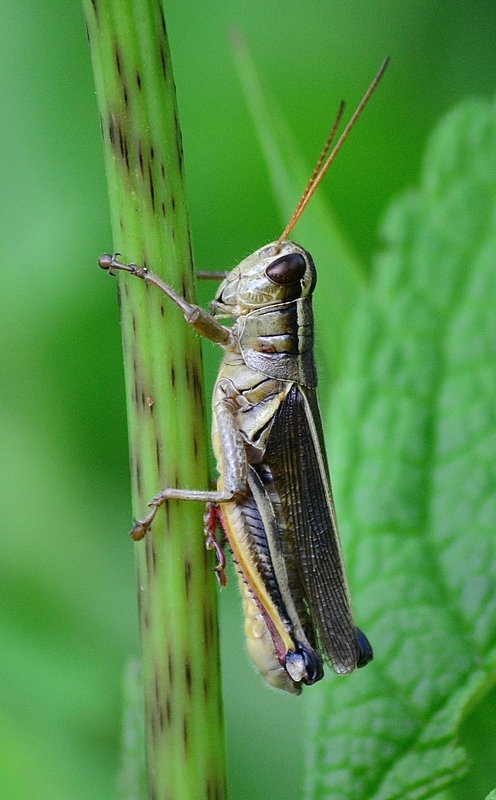 “The grasshopper has some means of defense as well as of escape; it can give a painful nip with its mandibles; and when seized, it emits copiously from the mouth a brownish liquid which is acrid and ill smelling. This performance interests children who are won’t to seize the insect by its jumping legs and hold it up, commanding it to ‘chew tobacco'”. What delightful and beautiful insects grasshoppers are! Watching them jump is highly amusing, their back legs are like springs. When I look at this photo of a grasshopper, I am struck by an urge to try to draw it. This was an exciting surprise. I was hunting the trees along the edge of the field for birds and my only thought was determination to take a pretty BIRD photo in the evening light. And what do I see? 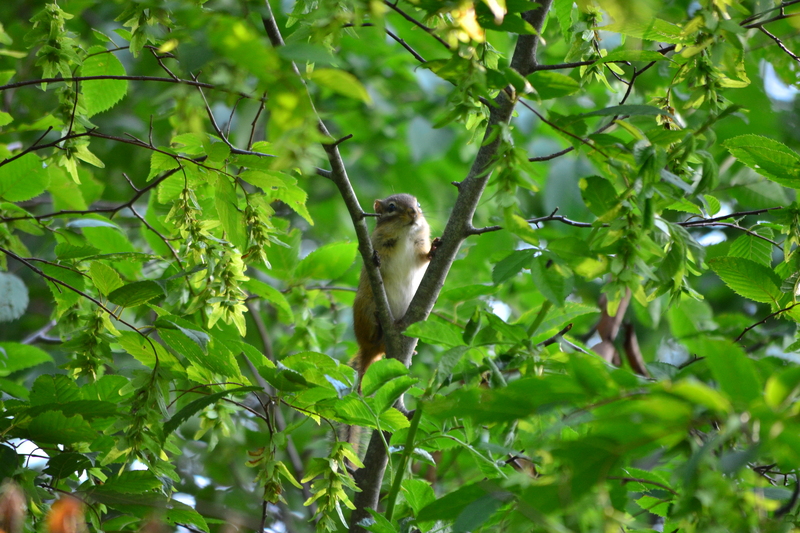 A tiny, chubby chipmunk way up high, frozen in fear as I photographed it. Look at those tiny ears. 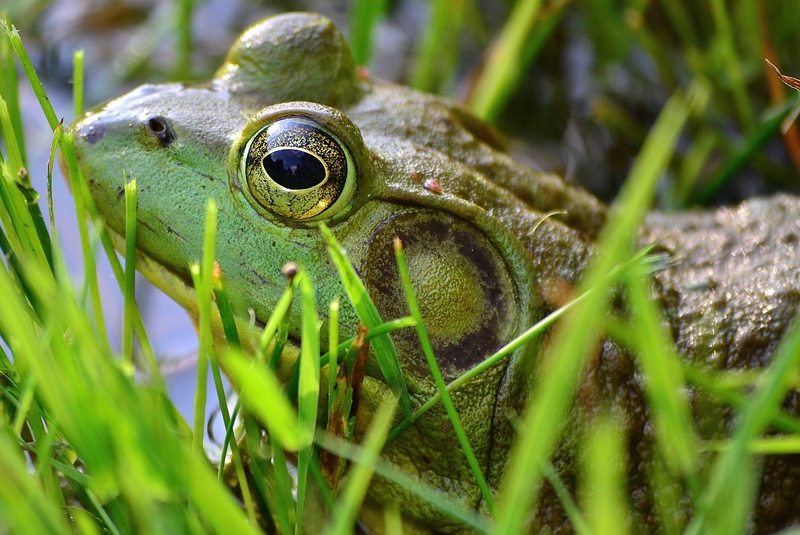 Even the bullfrog is lovely with it’s green and brown skin and gorgeous round & golden eyes shinier and prettier than any marble. You can see the sky reflected within it’s black iris. The round circle to the right of the eye is the ear. My sons love to catch bullfrogs and consider them friends of the pond. 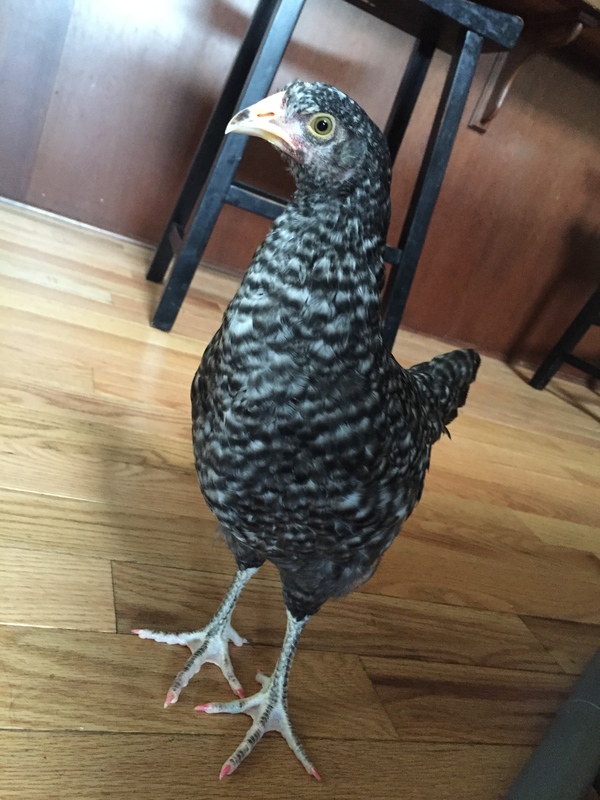 Notice anything special about this chicken? The hydrangeas are continuing to dazzle. Another surprise! 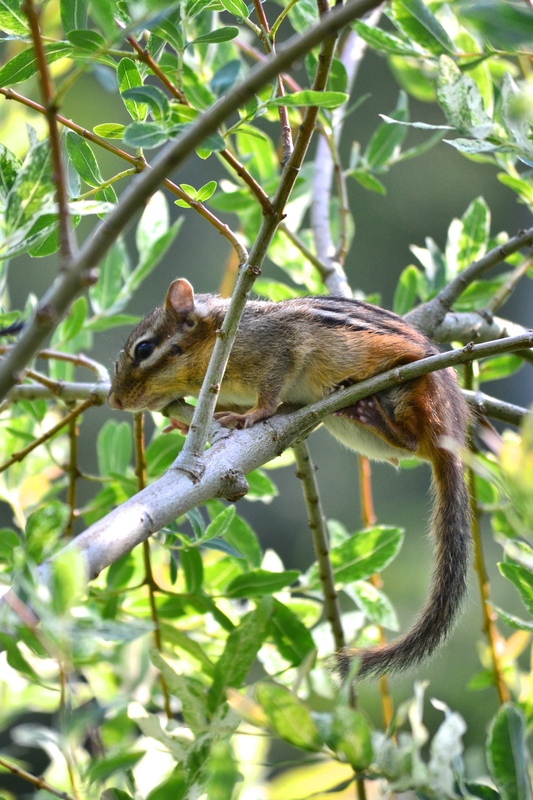 Just one week after seeing a baby chipmunk in a tree, I was sitting on the porch talking to my husband when my eyes landed on this one, way up high in the bush by our porch. Kitty on the porch probably chased it up there. 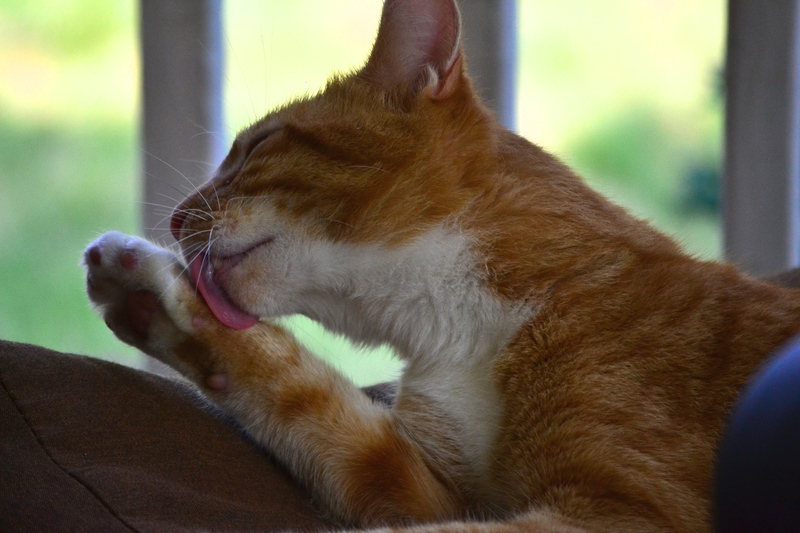 And after giving up on the chipmunk ever coming down, went back to his cozy seat on the porch to take a bath. 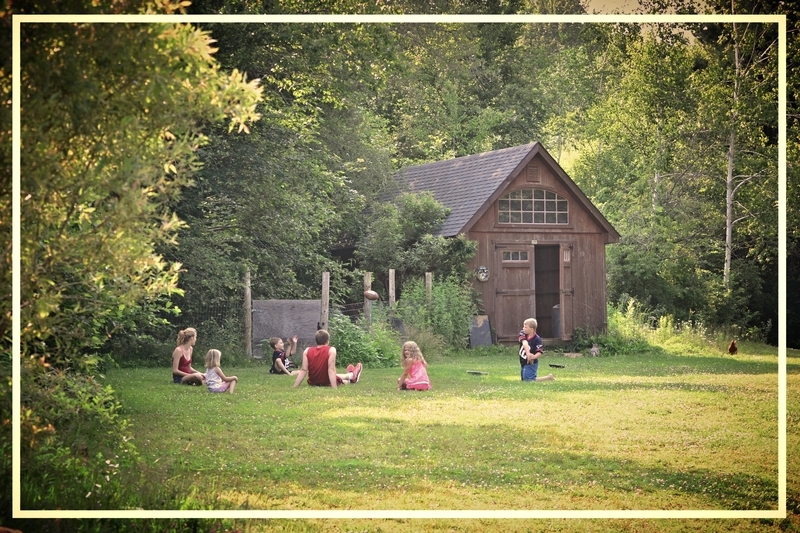 The children played a game of catch over by the chicken coop. I had many real and imagined worries about the children and their future and by the end of the day yesterday I gathered my journal and my Bible to me like a lifeline…knowing that I needed most of all to saturate my mind with the truth of God, that He is in control of all things and that I can trust Him with my (His) children whom I love so much that I never want to let go of them or these days. This entry was posted in a simply lovely life, faith, family, nature and tagged devotional, Emily, nature, Sherlock by Shanda. Bookmark the permalink. 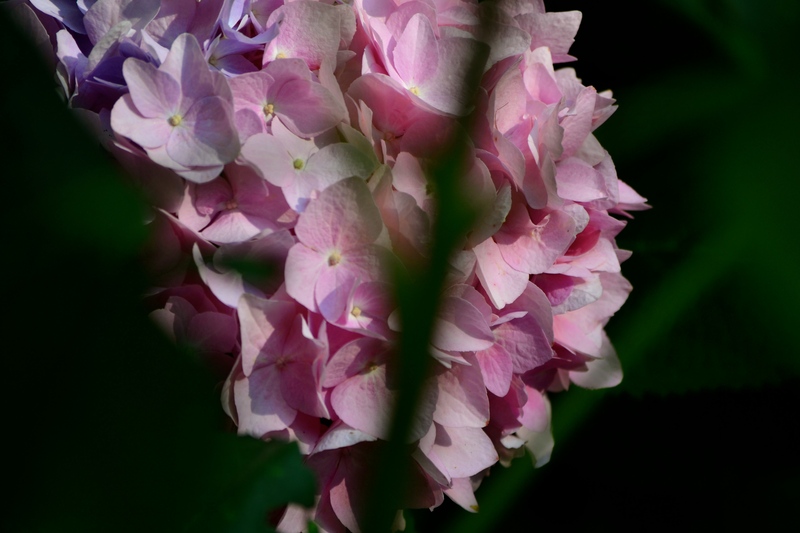 Emily and her cousin are natural beauties…and your hydrangeas are beautiful, too. Loved the encouraging quotes at the end, too. What would we do without Jesus? The sky reflected in the eye is awesome. 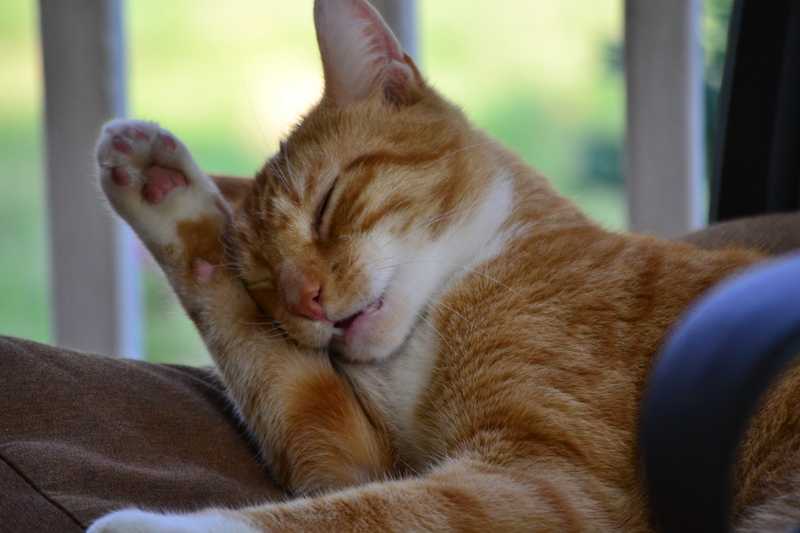 I love when things like that happen in photos! What a beauty reflected in this post.Great quotes. I need to complain to God more I think. I too am a worry wart for our family and life ahead unknown. I long for the Bible to be my lifeline as well. Eye on the prize- right?